All the world knows about the awful event which happened in 1939 – World War II. During Soviet times religion in Estonia was utterly forbidden. All Jewish people and all the synagogues and prayer-houses were eliminated. The original Tallinn Synagogue, which is also known as Beit Bella Synagogue, was constructed in 1883, but it was destroyed in 1944 during the air bombings of Tallinn. Since then Tallinn was the only capital in Europe which did not have a synagogue. In 2005 the construction of the new one began. 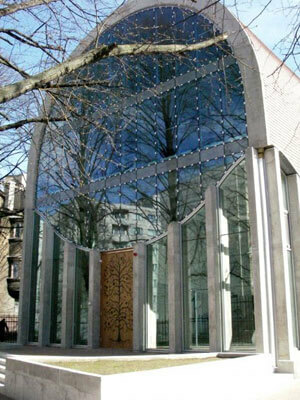 It was inaugurated in 2007 and was the first synagogue to open in Estonia since World War II. In spite of all hardships that the Jews of Estonia have met they still live here. People have overcome everything with the help of old Jewish tradition – supporting one another. Many events for people of all ages and social groups are being organized at the synagogue. The Jewish Community is trying hard to take the Jews back to their historical roots and strengthen their bonds. With the building of the new synagogue Tallinn has become the place where the Jewish life is successfully flourishing.